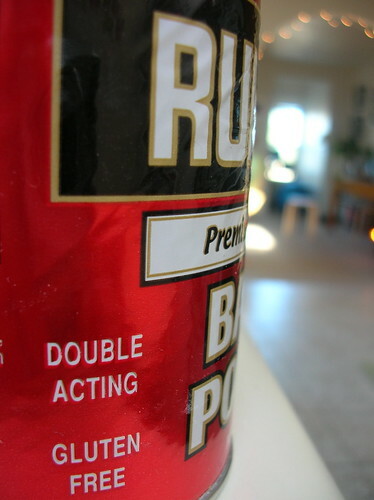 gluten-free baking powder, originally uploaded by shaunaforce. Yesterday was the crazy dance of the last day of school. We’re on break for two weeks, and everyone’s feeling fine. Certainly, there are stories. Dozens and dozens of stories. But I can’t tell you about school, even though I’d love to share the place with you. It entrances me. Wackiness. Kindness. Extraordinary moments. I love that wonderful school. But I’ve been asked not to share stories of it here, and I understand. It’s best to keep the two lives separate. But I can tell you this, because it’s true of any school on the last day before the winter holiday break, in every pocket of the country. My goodness, everyone was swooping down on the sweets. Everywhere, students clutched candy canes and homemade cookies. Teachers were diving into their gifts of Godiva chocolates. At the end of the day, the top of the faculty room table was dusted in doughnut detritus. Half-eaten cookies were ground into the carpets. After all, it’s the holidays, right? Usually, by the end of that last day, I’m ready to collapse with exhaustion, weary past the point of coherence. And this year? Well, I was fairly tired, and thrilled to leave the building (not because I don’t love teaching, but who doesn’t love a break?). But this year, for the first time, I wasn’t the kind of spirit-crushing, headachy, I-feel-as-though-I-need-to-lie-down kind of tired I have been for most of my life. Why? This year, I had to wave away all the homemade fudge, striped candy-cane cookies, gingerbread men, and sugary treats. They could all contain gluten, you see. Before, I would have succumbed to them all. It is the holidays, after all. And normally, I’m just plain tuckered out for most of the holidays. It’s no surprise to me now that whenever I caught pneumonia (six times in my life) or grew tremendously, terrifyingly sick, it was just around the holidays. Why? All those damned baked goods. Now, I’m entering this winter break with an energy I never thought I would have. Oh sure, last evening, I was exhausted, but so were all my colleagues. It’s hard to convey to anyone outside of teaching, but those last two weeks of school before the winter break are like walking through cold, sludgy molasses. (At least it’s probably gluten-free.) But today, I’m a new woman. Give me a solid night’s sleep and the solid understanding that school is actually over, and I’m back. Who was that the last two weeks? Well, I know that not being able to exercise had been playing with my mind. (The broken foot has kept me from fully using my body for six weeks. But it is, happily, quite well healed now. Thank you.) Today, I feel fierce and alive. I’ve been cooking, writing, singing, taking photographs, looking at the light, dancing, talking with friends on the phone, seeing other friends, and even doing a little work for school. (We may be on vacation, but we’re not done yet. We teachers have all the student evaluations and letters of recommendations to write.) And there’s the pesto I just made for the gluten-free pasta that’s cooking, plus a friend’s party soon. Life’s feeling good. Still, it’s hard to turn down all those treats. Why is it that people seem to feel as though you are attacking them personally if you don’t eat their home-baked goods? Do we all have to express our love in big bites this time of year? Those of you who can eat gluten have no idea what it’s like. I know. I didn’t, before this. Even the people who are looking out for me ask me questions that baffle me now, questions that I would probably have asked before. You can’t eat sugar, right? (No, sweetie, that’s glucose.) Is there gluten in rice? Do beans have gluten? When I demurred on eating the potato-cheddar soup a friend had bubbling on the stove at her party last night, another friend said, “Oh, that’s because of the potatoes, isn’t it? How do you live without starches?” (Actually, potatoes do not have gluten. And I only passed on the soup because my friend had bought it at a store, and she didn’t know if it had been thickened with flour.) I can tell from the panicked search questions that lead people to this website–“Does eggplant have gluten in it?”; “gluten in pomegranates”–how little real knowledge is out there. Of course, I’m doing what I can. Why is it that one out of five people I meet seem to have some sort of food allergylactose intolerance; problems with corn; violent reactions to tomatoes; instant reactions to tropical fruitsand yet, those of us with food allergies are regarded as some sort of cranky freaks? Complainers. Too sensitive for our own good. And I’ll be the first to admit it: before I was diagnosed with celiac, I thought people with food allergies were…a little questionable. Aren’t you just trying to draw too much attention to yourself? Come on, what harm would one bite do? Well, last week, a 15-year-old Canadian girl with a severe peanut allergy died because her boyfriend kissed her, after he had eaten a peanut butter sandwich nine hours before. Apparently, she never told him, because she was embarrassed about being seen as too unusual for him. And no wonder. When I was searching for this story online, the first page of hits included one newspaper that had put this story in its “Odd, Weird, and Quirky” section. Thanks. The girl dies, and that’s quirky. Anyone who reads this website knows how joyfully I approach this entire endeavor. I try not to complain, because there is so much great food for my discovering. Rarely do I feel deprived, particularly in the face of real suffering in the world. But every once in a while, I grow annoyed, a little saddened, at feeling like the odd eater out. And gluten intolerance is really not that hard to understand. I want everyone in the world to be educated about this, so that we don’t have to feel like freaks anymore. But especially, so that we don’t have to be sick anymore. Luckily, we’re at a turning point right now. This culture does seem to be waking up about gluten intolerance in particular, food allergies in general. I can’t imagine how hard it must have been to be a celiac twenty years ago, with the dearth of products and awareness. Now, there are hundreds of gluten-free products out there. Last week, at my party, people brought dozens of them for the gluten-free potluck. I never thought I would promote them, but WalMart recently announced that it is requiring their private-line foods to be labeled gluten-free. And the Food Labeling Act of 2004, which goes into effect in January of 2006, requires food manufacturers to list the presence of the eight leading causes of food allergies: milk, eggs, fish, crustacean shellfish, tree nuts, wheat, peanuts and soy-beans. Notice that it doesn’t list gluten. That’s another four years, at least. But having wheat listed on a package will help. We’re on the right path. Before my celiac diagnosis, I never thought that two words (or one hyphenated word, if it’s before the noun) on a package of food would ever make me so happy. Gluten free. That’s all it takes to make me happy in a grocery store. If food producers were smart, they’d all start labeling this way. Those of us with celiac (or with other reasons to avoid gluten) leap at any product with the gluten-free label. We’re a fiercely loyal bunch. And we need this food. We’ll buy it, in droves, if it says gluten-free. I don’t know about everyone else, but I feel recognized, even appreciated, when I see a product with gluten-free on the label. Now, if you’ve been reading, you know that I don’t even eat many packaged foods anymore. Whole, fresh, in season, homemade–this is my food. But on the bus ride home, after the last day of school before the winter break, I had (temporarily) run out of ideas. Suddenly, I just wished I had a tv dinner in the house. Or a quick take-out place I could call. But of course, there’s no gluten-free Chinese take-out in Seattle. Walking up the steps, I saw that my mailbox was bulging with a package. It is the holidays, after all, so I wasn’t shocked. But when I picked this one up, I heard it rattling. Looking at the address, I softened into a smile. Alison, from Alaska. Every summer, I teach creative writing at a fabulous fine arts camp in Sitka. And every year, Alison has taken my poetry class. We’ve become wonderfully close, even though we only see each other for two weeks out of the year. But I hadn’t heard from her in awhile. I’ve been busy too. Seeing her name made me happy. Opening the package made me happier. Why? Because she had sent me photographs, a rambling letter, and a package of Annie’s gluten-free macaroni and cheese. She’d seen it in the store and thought of me. So, she sent me that night’s dinner. I love macaroni and cheese. In fact, mac and cheese from scratch was the first dinner I learned how to make as a kid. And even now, I can make a damned fine one with Tinkyada pasta, gruyere and smoked cheddar. But sometimes, you just need a box of mac and cheese. And how damned great is it that, finally, there’s a gluten-free package of cheesy goodness and recognition? Sometimes, all it takes is two words on a label to make me feel loved. annie’s is the BEST. I’ve been eating mild mexican for years. 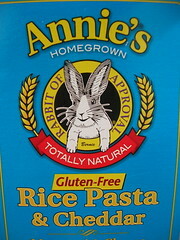 I like rice pasta, and I can’t wait to try this version of annie’s next time I’m in the states. What a wonderful treat! Enjoy your break. I am glad that you are feeling energized as you go into this new venture. Thank you for sharing your optimism. Mine seems to be broken right now. Guess you’ll have to join us in Europe! The EU also passed a law about listing major allergy causing ingredients on packaged foods, gluten being one of them. Before I discovered your blog a couple of months ago, I probably just would have scratched my head at that bit of information. Thanks for raising our awareness. I LOVE Annie’s – it’s a regular standby in our house for nights like yours – when even cooking is a wonderful destressor, sometimes it’s nice to have a pre-made but made-with-love meal. I’m so glad to see that not only do they produce wonderful macaroni, they do it Shauna-style too! I’m sure you are going to make lots of wonderful holiday treats that are gluten-free. You have made the transition to a gluten-free life seem more of an adjustment than a terrible scenario. Hope your break from work continues to be as wonderful as it has started out! Do any of you fellow celiacs have a great recipe for gluten free biscotti? It’s my favorite, and I miss it so much! I’m in a similar boat as you in that I need to search labels for milk proteins and if I’m not careful I can end up eating something I think will be just fine, but for some inexplicable reason it contains whey. Ugh. The Food Labeling Act should help with that, for us lactose intolerant types, but how awful that gluten’s not on the list yet. Someone in the government dropped the ball on that one. This is my first time posting on your blog. I’ve been reading it for awhile after it was mentioned in Kerri’s blog awhile back. I’ve been living with Celiac Disease since 1999. While it does become second nature to live with this – there are still times that I get depressed about it all. Someday it will get easier to eat out – and we won’t get those funny looks from people when we politely decline some tasty treats being offered to us. A cure sure would be nice 🙂 Thank goodness the labels on products are getting better. I live in Canada and as of January all products have to have all this information properly attached to the packaging. It’ll make a huge difference. Ok, I’m babbling now! Have a great gluten-free holiday season! Oh, another place that sells gf treats … try http://www.kinnikinnick.ca I believe they ship to the U.S. too. I was absurdly happy when I picked up a single-serving package of Utz potato chips, squinted at the fine print on the back and found “This is a gluten-free food” at the end of the ingredient list. I was at an event and, as expected, there wasn’t anything I could eat. I was hungry even though I’d eaten before I got there and I found the bowl of chip bags and grabbed one for a looksee at the ingredients. This labelling is new. I’d been eating Utz chips for a while and that was the first time I’d seen the gluten-free label. I don’t understand the inclusion of millet on the Utz banned list but better overinclusive than underinclusive. Obdisclaimer: No affiliation with Utz save as a satisfied celiac customer. This is a wonderful post. I love when your writing turns to talk of teaching; too bad it seems to be a “banned” subject. Maybe someday you will have many stories to share. I want to tell you that since discovering your site and doing a bit of research and deducing that I, and probably most of my family, have gluten intolerance, I have been eliminating it from my life as best I can and I’m starting to feel energy that I haven’t felt in about 20 years. My life was always full of sickness, allergies, severe asthma, dermatitis. But worst were the headaches and nausea that have plagued me on and off for about 5 years, digestion problems, acid reflux, the whole works.I would get attacks that sent be to bed for a whole day and feel sensitive all the next. I cleared up the asthma by cutting out dairy products. Now the other problems seem to be receding. It’s wonderful to have some hope of feeling really well. There are a few challenges living here in Japan. Food labeling is very hard to read, so I have to assume almost nothing is safe. But sometimes I can get a few health food products when I visit home or from suppliers here. So I really appreciate it when you recommend gluten-free brand names. And thanks so much for making me aware that all along my health problems may have been caused by celiac disease. (I’m going to get tested on my next trip home.) I really appreciate the work you are doing here! As we say here, gambatte! Oh, and have a great gluten-free Christmas!!!! Oh, girl, I feel your frustration on this post. It seems so tough to explain what seems simple to us now. I’m not a celiac, but I have friends who are and I do have wheat and dairy allergies (both are a protein reaction, not the same as lactose or gluten intolerance) and having to pass on food means having to explain to people why. They either joke about it or show extreme pity. Both of those irritate me. I work in a restaurant that has some gf/df dishes, and this year for our Christmas party the chef made a main course that I could eat – the best gift I have gotten so far this year. Way to go on your Le Creuset, by the way! Travis, I agree! Annie’s has always been a favorite of mine. All my students grew up with it. And now, the gluten-free version? Fab. Beastmomma: Thank you. It’s quite the revelation to me to feel energized in December. I didn’t know it was possible! Sasha, keep your spirits up, my dear. Thank you for sharing what you did on your blog. It can be hard to be surrounded by people partaking of goodies we can never have. But just remember how much worse you’d feel if you ate them. You’re right, Michelle. Sometimes, we still just want to be kids and have food out of a box! Thank you, Steph. You know, I’ve talked with lots of people who regard this diagnosis as a punishment. But for me, it has been a blessing, a continual opening outward. Thanks for recognizing that for me! Katie, I do have a good biscotti recipe, from the cookie class I took a few weeks ago. If you’re reading this, email me, and I’ll send it your way. Mrs. D, I didn’t know you couldn’t have milk proteins. You see? Another one of us. I know — the lack of labeling of gluten mystifies me. But I think there’s no real consensus as to what gluten free actually means yet. I could tell them! Jamie, thank you for leaving a comment. I didn’t know you were out there! Yes, I had terrible gluten nightmares for the first few months. They make me laugh now. In fact, that inspired a story I’ll have to write about this week. Your comment was the impetus for it! Lisa, thank you for this update. Millet used to be questionable, because again, there was disagreement as to whether or not it is gluten free. It is. But Utz just must be behind the times. I’m glad to know there’s another product we can eat! Islandchi — wow! I had no idea you were going through all of this. And if my site helped you to start investigating all this, I’m thrilled. I can’t tell you how many people I talk with who are waking up to this. In ten years, I know we’ll regard all of this differently. Good luck to you. Keep me updated! Jena, I’m so happy that the chef made you something you could eat. Yes, I sometimes feel left out as well. But on the other side, I feel such enormous gratitude when someone makes me gluten-free food. I had never experienced that before. It’s worth it. I can’t tell you how often I get that exact same comment, and give the exact same response. Just over the holidays I had one of my husbands relatives comment that my Tinkyada pasta would probably be great for her husband because he’s diabetic. Ummmmm no darling it’s GLUTEN free not GLUCOSE free!! Ofcourse I pointed out her mistake but it cracks me up every time. Shauna, I just started reading your blog and I love it! You mentioned that you have an awesome homemade macaroni and cheese recipe w/ gruyere and smoked cheddar and I was wondering if you’d mind giving it to me. Thanks and all the little tips about things like chilling gf flour are so helpful!